Citizens! John Crewe has answered a dozen questions about the Aegis Sabre! John Crewe, Senior Technical Designer at Foundry 42 has answered a dozen questions from fans about the Aegis Dynamics Sabre! At CitizenCon, the Sabre has been called “ninja-like.” What does that mean? Can you elaborate on what a “multirole stealth ship” is? The “ninja-like” meaning comes from its ability to lurk at the edge of combat zones undetected, infiltrate quickly without raising the alarm, hit hard and use its speed and capabilities to get out. Its multi-role capabilities come from its twin internal bomb bays which can carry a variety of payloads, you can rock a load of S1 missiles if you want, fill it up with some more advanced larger missiles or other non lethal options. Can you elaborate on why someone would pick the Sabre as opposed to the Hornet, and vice-versa? How does this relate to the Hornet Ghost specifically? The Hornet is a tank, it’s not particularly mobile but can really take a pounding and make it out which is a great feature for a lot of players. Its similar in my mind to how current day pilots love the A-10 for its rugged reliability and ability to come back home with huge amounts of damage. The Sabre on the other hand is not tough, it relies heavily on its ability to not be detected and then its array shields to keep it safe. Once those shields are down you’d best be on your way out of combat else you’ll probably not make it back. Compared to the Hornet Ghost the Sabre is built from the ground up to be a dedicated “stealth” ship whereas the Hornet Ghost is retrofitted to become stealthy, therefore whilst the Ghost is still very stealthy compared to other ships it wont be quite as impervious to radar as the Sabre. What little it lacks in stealth capabilities compared to the Sabre though is made up for in its additional armour and weaponry however. How well will the Sabre handle in comparison to the Gladius? Will it be a good ship for Gladius pilots to transition into? The Sabre is going to handle very similarly to the Gladius, if you look closely the manoeuvring thruster type and placement is very similar to the Gladius. If you enjoy flying the Gladius the Sabre should behave broadly the same but with a little extra weight to it. 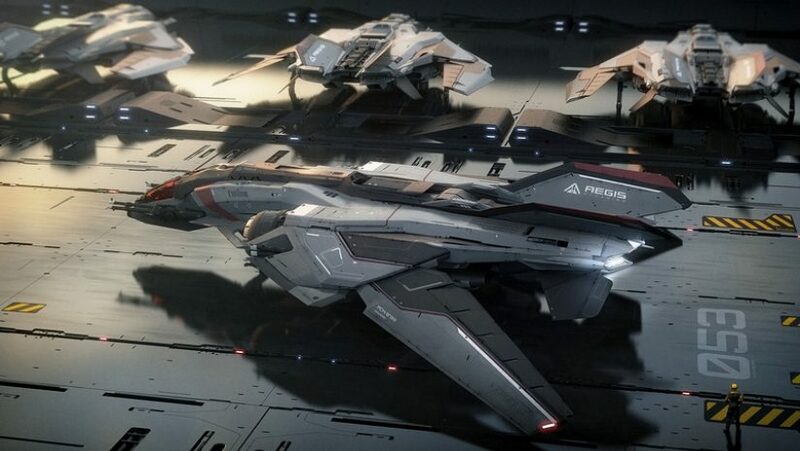 Similarly to the arrival of the Gladius, I welcome the addition of the Aegis Sabre to the array of fighter ships in Star Citizen. I feel that the additional variety will serve to cover a greater variety of combat play styles. Plus… the Sabre is absolutely gorgeous!